Velocity American Express Platinum - 60,000 point sign on bonus and more! 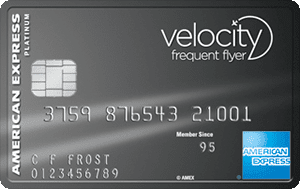 One of the credit cards I recommend most is the Velocity Platinum Amex. It has some of the best benefits and earn rates of any card in Australia. Sign up using my link here and be rewarded with a 60,000 point sign on bonus. You also get a complimentary return domestic flight, 2 Virgin lounge passes, 2 Amex lounge passes, insurances and more! Find out more by clicking here.